Get instant access to our digital maps of ALL 1.13 million acres of Wisconsin Managed Forest Law (MFL) hunting land. 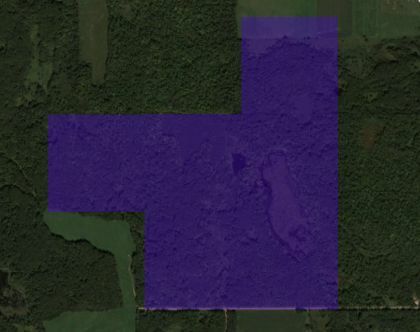 FreeHuntingLand.com is the only place you can see nearly all the Managed Forest Law (MFL) hunting land in one place, with Google Earth, overlayed on satellite imagery with GPS location. Includes DNR Managed lands, National Forest land, County Forests, and Forest Crop Law land too! Get Instant Access Now! MANAGED FOREST LAW - 1.13 Million Acres in "Open"
1. Two options for owners enrolling in Wisconsins Managed Forest Law (MFL) Program: "Open" and "Closed" designation. 2. On open land, permit public access for hunting, fishing, cross-country skiing, sight-seeing, and hiking. 3. At least 10 acres of contiguous forest land located in the same municipality. 4. At least 80 percent of the land must have a minimum productive capacity of 20 cubic feet of timber per acres in a year. 5. Owner pays $0.83/acre annually if enrolled before 2004, $1.46/acre if enrolled after 2004. 6. If the terms of the contract are violated or land is withdrawn from the MFL program, the landowner is liable to pay a severe penalty. 7. Read more about Wisconsin Managed Forest Law hunting land at Wisconsin DNR site. 8. The picture on the right is a close up of approximately 230 acres of Wisconsin Managed Forest Law (MFL) hunting land in Burnett County. Imagery Copyright 2009 Google, 2009 TerraMetrics and captured from Google Earth.